Dark Sky describes itself as a “hyperlocal” weather app, specializing in micro-forecasts for the two-foot square that surrounds you and your phone. I was walking around on a warm afternoon in Florida when I downloaded it. The forecast predicted a light downpour starting in 4 minutes and lasting for 7 minutes followed by clear skies. Sure enough, I had just enough time to duck under an overhang before the rain came down. And it lasted almost exactly 7 minutes. Not all the predictions have been that accurate, but it’s a beautiful, simple, useable resource that has become my favorite weather app. When you open the beautiful Yahoo Weather app, you’re greeted with an exquisite Flickr photo of the area around you. You have the regular features you need in a weather app… daily forecasts, weekly forecasts and the occasional ad. For the Dignified Professional Who Enjoys an Occasional F-Bomb: What The Forecast?!! My mama would never let me read these forecasts aloud, but the NSFW honest descriptions will make you laugh every time. They won a Webby Award this year because everyone loves them. Some of the forecasts are just funny, and some drop the f-bomb. You can set the profanity filter to keep it clean, but it’s funnier when it’s naughty. The beating heart of our brand is the generous and passionate community of weather enthusiasts that share weather data and content across our products. With 250,000+ of our members sending real-time data from their own personal weather stations, they provide us with the extensive data that makes our forecasts and products so unique. 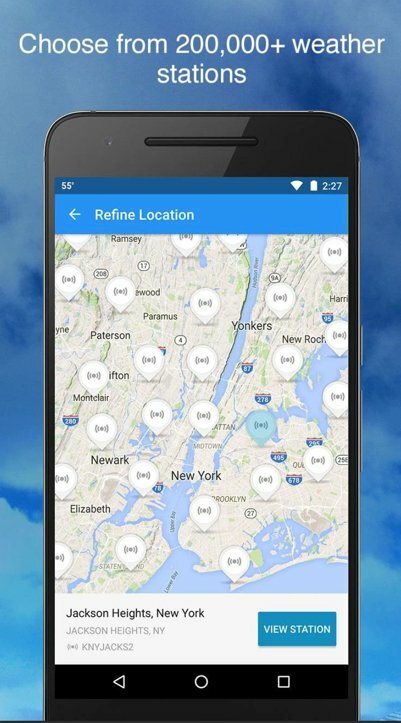 If you’re a storm tracker, you’ll love this app. 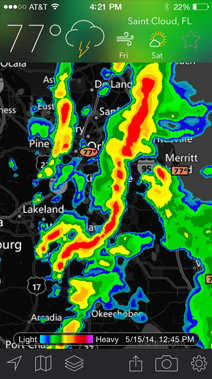 It gives you NOAA alerts, storm tracking and radar views anywhere you need to keep an eye in the skies. Say it with me… awwww! 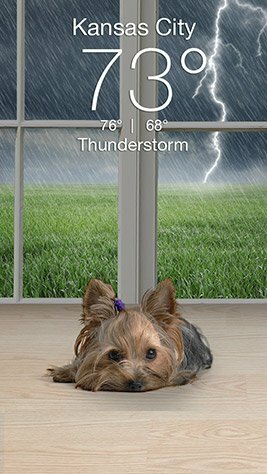 Weather Puppy gives you your daily forecast with a touch of adorable. Animal non-profits and charities have partnered with these founders to provide an app that features puppies, and, of course, they change with the weather and time. You can even upload pics of your own pooch.